Last week, I ran a workshop for the Lace project on “Learning Analytics: seeking answers at a time of big questions?” at the ALT-C14. 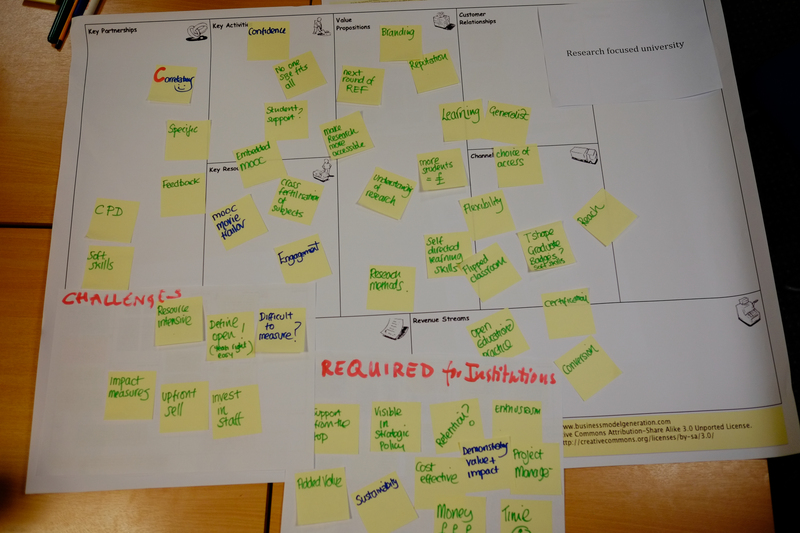 The workshop was designed to bring together educators, researchers and developers to explore the promises and the pitfalls of using learning analytics in education. A brief introduction to the workshop is available here. At the workshop, participants were invited to work in groups to develop scenarios around learning analytics in institutions and the issues and concerns related to using data in education, teaching and learning. About 30 participants from HE institutions, commercial companies and other educational organisations shared their thoughts, experiences and current projects and work on learning analytics. Although four groups worked independently, not surprisingly, a common theme emerged at the plenary session: using learning analytics as a means to engage students. 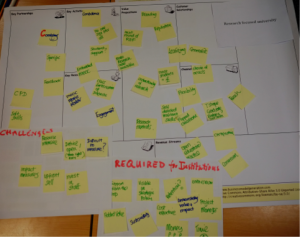 Several scenarios were developed around building dashboards to track student engagement; monitoring student performance and supporting individual and group online learning; and engaging international students, distance learners and students in MOOCs, etc. What are the motivations for using learning analytics? What systems, tools and data are available? How reliable are the data? How up to date are the data? 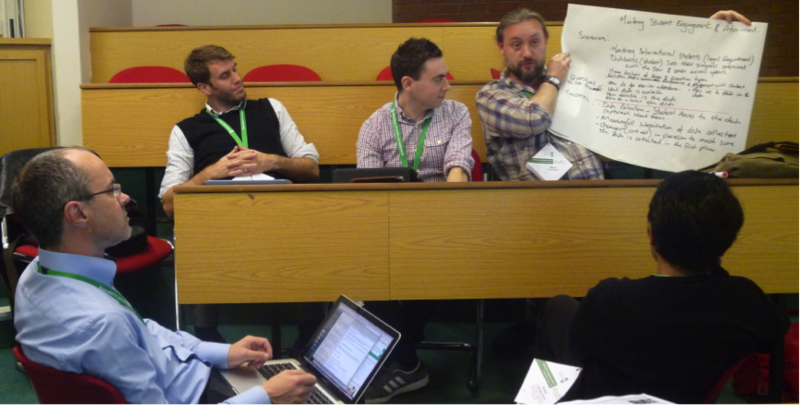 How can data from multiple sources (VLE, Facebook, twitter) be monitored and analysed? How may we identify similar behaviours among high or low performance students? Due to the time constraints of the workshop, with participants from different types of organisations with various level of knowledge and skill on learning analytics, it was difficult to have a deep discussion around such broad and challenging topic. However, most participants thought that the workshop provided an opportunity for them to find out what other people and institutions are thinking and doing, and to share their ideas and experiences, in this case, how to engage students through learning analytics. If you would like to find out more about the Lace project and learning analytics, you can join the Lace community or participating in our future workshops. The third annual Open Education Week takes place from 10-15 March 2014. The purpose of Open Education Week is “to raise awareness about the movement and its impact on teaching and learning worldwide“. 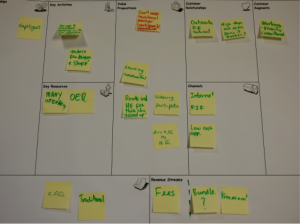 Two years ago, Lou McGill developed an Open Educational Resources timeline which reflected on the involvement of Cetis with learning technology and OERs over the past ten years. I found it very interesting and thought provoking. 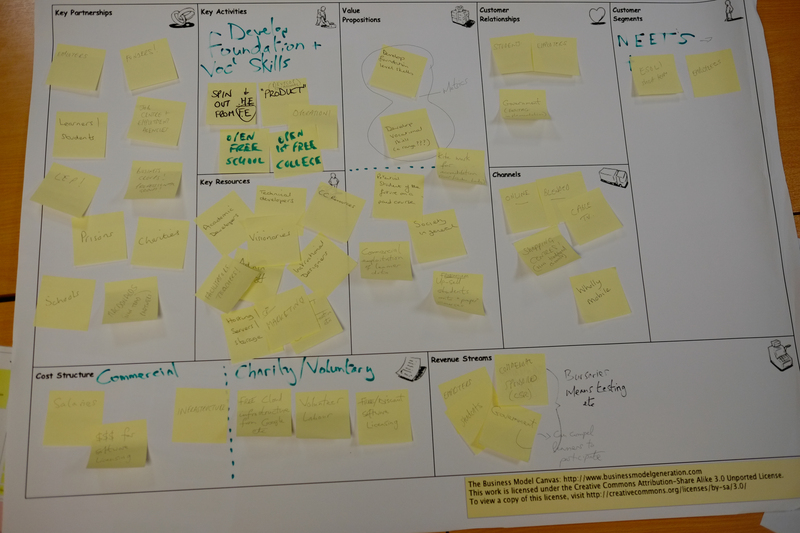 In this Open Education week, I would like to share some thoughts and reflections on Open Education through my personal learning journey and some of the work that I have been involved in with OERs, Open Online Learning and MOOCs. 1. Back in 1985, I signed up for a Self Study Higher Education Programme when I worked as a school teacher in China. Since the 80’s, China has built the world’s largest Open Education system to meet the needs of people who are not be able to attend a college or a university face-to-face. The programme is open to everyone regardless of age, previous education or qualifications. They can choose to study any subject that they are interested in (from a total of 21 subjects), either self-taught or study with peers and tutors at local learning centres. Those who pass examinations gain qualifications equivalent to a college degree. More than 3-million Chinese students have obtained university degrees via this programme over the past two decades. When I was half way through the programme to gain the degree in Chinese, I was offered an opportunity to study at Beijing Normal University. As a result, I didn’t take all of the examinations, but the two years of self–study did add great value to my life at that time and it continues to this day. In this example, it is very clear to me that although the self-study programme would have advanced my career, the four years of study at Beijing Normal University changed my life and career direction completely. Learning for the sake of learning is a luxury that few can afford. In the case of MOOC students, research suggests that most of them are already well-educated professionals. For many learners undertaking tertiary education, gaining a degree qualification is the prime motivation as they believe it will enhance their career opportunities. Open education involves not only access to course materials, but also appropriate support and guidance. Therefore, how to make university education more accessible, valuable and meaningful to learners is a challenge that universities cannot ignore. 2. I have been very lucky to be involved in shaping and supporting the UK OER programme since I joined Cetis in 2008. This has given me a unique opportunity to work with UK institutions and the wider OER community to understand the opportunities and challenges of OERs from an institutional perspective. In the UK, more than 80 universities have been involved producing OERs and making teaching and learning material searchable, sharable and reusable globally. One question that all funders, institutions and educators would like to answer is: how might OERs be shared and reused by others? We can celebrate the success of funded OERs projects but we must also question the sustainability of these initiatives after their initial funding runs out. There are some individuals who are inspired by the global OER movement and who spend their time and efforts promoting OERs. These grassroots OER projects are, I think, more sustainable in the longer term. For example, here is an OER/Open Course collection created by Dr Ma, a scholar from a Chinese University. He and his students gathered a large number of OERs and Open Courses in educational technology produced by universities from the UK and US. At present, these courses have been translated into Chinese and reused by Chinese lecturers who teach relevant courses to students who are studying educational technology. Some lecturers from Chinese universities have also started to use this platform to make their courses open and to share with educators in other universities. 3. 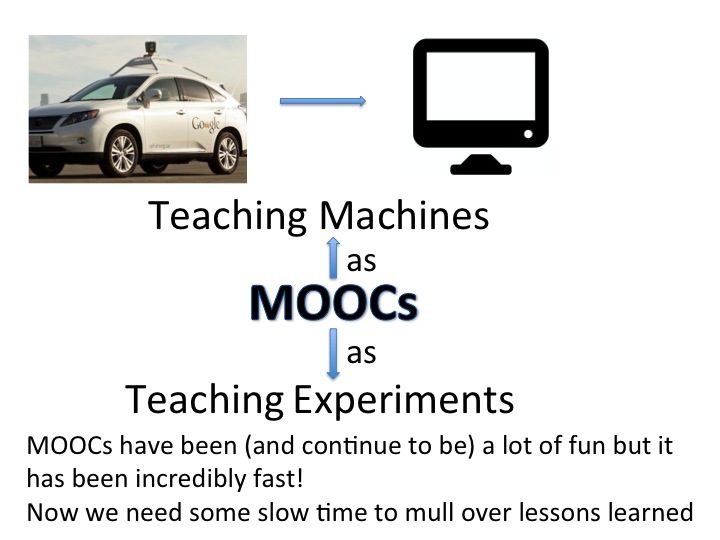 The rapid development of MOOCs, highlights the question about business models again and again. Commercial startups, such as Coursera and Udacity have been experimenting with various revenue streams and recently have focused on professional training, credit-bearing courses and international markets. It seems an obvious question for institutions: what is the business model if the course is free? In 2010, my colleagues and I at Institute for Educational Cybernetics developed an Open Online Course for Masters students, who were studying educational technology in China and delivered it in partnership with a Chinese university. 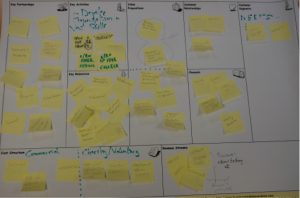 We used a blended learning approach with a local facilitator. This course helped us gain a better understanding of language, cultural, pedagogical and access issues in other education contexts. It also gave us an opportunity to explore some ideas on how to scale up to make open online courses financially viable for institutions. Institutions will need to identify a particular market niche that differentiates itself from its competition and makes the courses sustainable over the longer term. 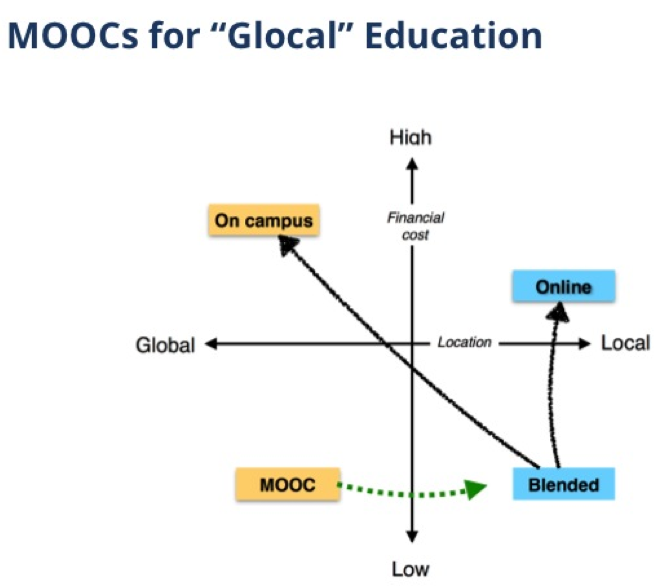 With expansions of MOOCs, students can start looking at different degree programs at different universities around the country or around the world. Institutions will need to think beyond MOOCs. They need to design and develop high quality open online courses to enable students to study online or blended courses in their home countries. These courses need to be affordable, accessible and flexible to meet the different needs of learners globally. Finally, it is worth mentioning that a new Europe-wide initiative, “Open Education Challenge” has been launched to encourage innovations in education through funding educational startups in Europe. I am currently involved in preparing a bid to address some of challenges in open education and help institutions develop new models for sustainable open online courses. Hopefully, this initiative will give educational practitioners and innovators a new opportunity to work together and bring about a substantive change in education worldwide. 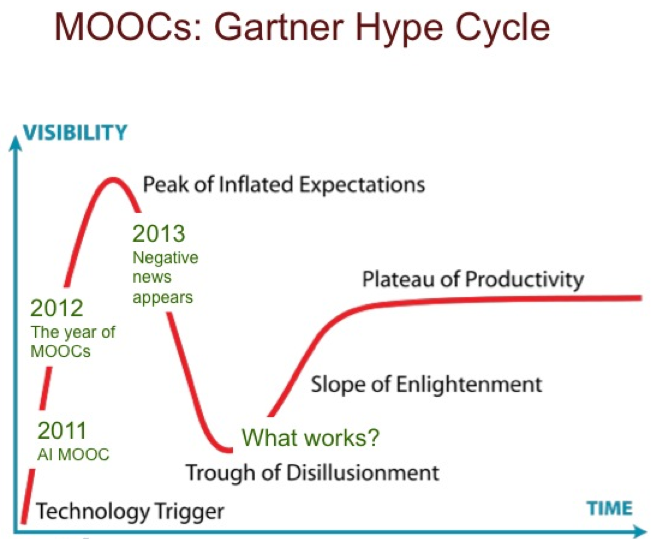 It is now six years since the advent of the first MOOC course, and 2012 is widely identified as the year that the hype surrounding MOOCs reached its peak and in 2013 began its path into ‘trough of disillusionment’. 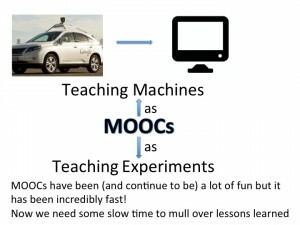 The key questions for institutions are what lessons we might learn from the MOOC experiment and how this may help institutions to develop a more strategic approach to improve the quality of teaching and learning and open up access to higher education? Following the well cited Cetis white paper ‘MOOCs and Open Education: Implications for Higher Education’ (BIS, UNESCO, Universities UK), this new report looks beyond the current debate on MOOCs to understand the potential of open online learning for learners, educators and institutions from pedagogical, financial and technological perspectives. 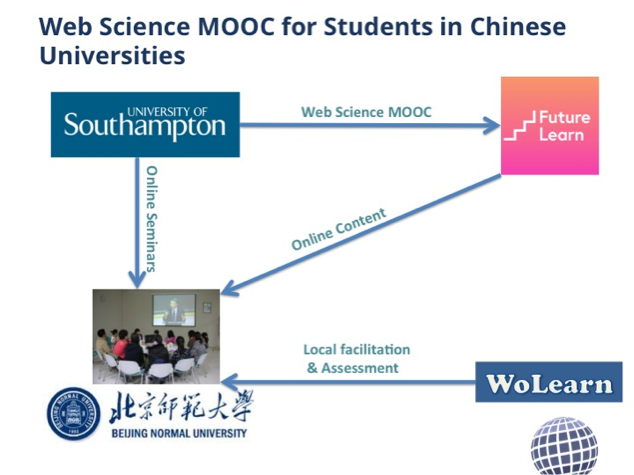 In this Beyond MOOCs white paper, we discuss key concepts emerging from the MOOC development that may have significant impact on future HE, these include openness, revenue models, and service disaggregation of HE provision. We also identify the areas that institutions may consider to explore with open online provision through the lenses of technology options, pedagogical opportunities and learner choices. In conclusion, we provide a decision-making framework to address questions of what form or forms of online learning provision would be appropriate to meet a particular organisation’s business needs. Hopefully, this report will stimulate further discussions and debate on exploring the opportunities developed by MOOCs and to experiment with new forms of provision that go beyond HEI’s existing markets. 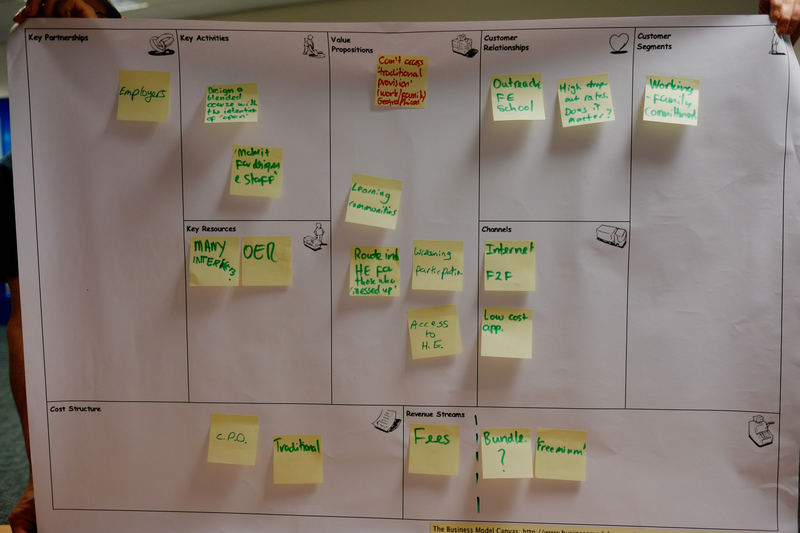 We would welcome opportunities to continue discuss and explore ideas around open online learning in higher education in future workshops and seminars. If you are interested in discussing the implications of this paper for your institution, please contact Li Yuan at l.yuan@bolton.ac.uk, Stephen Powell at stephenp.powell@gmail.com or Bill Olivier at B.Olivier@bolton.ac.uk at Cetis (http://www.cetis.org.uk). eBooks in HE institutions – are we ready yet? eBooks is one of technologies that many believe will have significant impact on education; and indeed will change the way of teaching and learning in schools and universities. In essence, both eBooks and printed books are very similar in as much as they allow people to do the most important thing – read a book. However, compared to traditional books, eBooks offer new ways to distribute and interact with information. Take, for example, the eBook produced by the Oxford Internet Institute, “Geographies of the World’s Knowledge”, a research report on where and how knowledge is distributed across the world. Readers can select pieces of the pictures in this book to zoom in on and to glean further information as they wish. They can navigate to particular pages via interaction with the visualizations. The rapid development of E-readers, tablets and mobile technology in recent years, such as Kindles, iPads and smartphones makes buying, downloading and reading eBooks more popular and easier. As a result, more and people are reading routinely on their electronic devices. In particular, the younger generation, reading is the tool for much social activity and experience through the sharing of notes and comments instantly. With these social networking developments, it is clear that there will be increased demand from learners for eBooks within academic contexts. Education will need to change to provide a more interactive learning experience and access to content anytime, anywhere as promised by using eBooks. However, despite all the hype, eBooks have remained on the fringes of higher education. For institutions, eBook technology is still new. There are many questions needing to be answered in order to embed eBooks in teaching, learning and research. For example, is eBook technology mature enough for education? Is it time to invest heavily in e-textbooks in institutions? What are the technical and cultural challenges we are facing and how can eBooks be best used in academic contexts? We don’t know the answers to all of the questions, but it is clear that we need more information and knowledge about eBooks to make well informed decisions. Hopefully, the newly published JISC Observatory TechWatch report on “Preparing for Effective Adoption and Use of Ebooks in Education” will help decision makers, IT managers, librarians and educators to gain a better understanding of current issues and challenges in adopting eBooks in institutions. In this report, the author, James Clay, introduces the history and key concepts of eBooks and discusses the technical, cultural and legal challenges that need to be addressed for the successful adoption of eBooks in education. Furthermore, it offers scenarios illustrating the effective use of eBooks in libraries and in teaching, learning and research in institutions. It also provides us with useful insights into the future directions of eBook development.